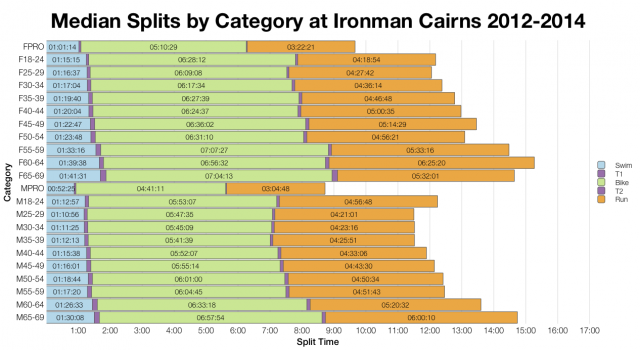 Ironman Cairns is the last chance for 2015 qualification down under. It’s a small event in comparison to the other Australian Ironmans, but it still provides the standard 40 slots for the Ironman World Championship. As a last chance for those chasing qualification it’s never going to be an easy battle to grab one of those places though. 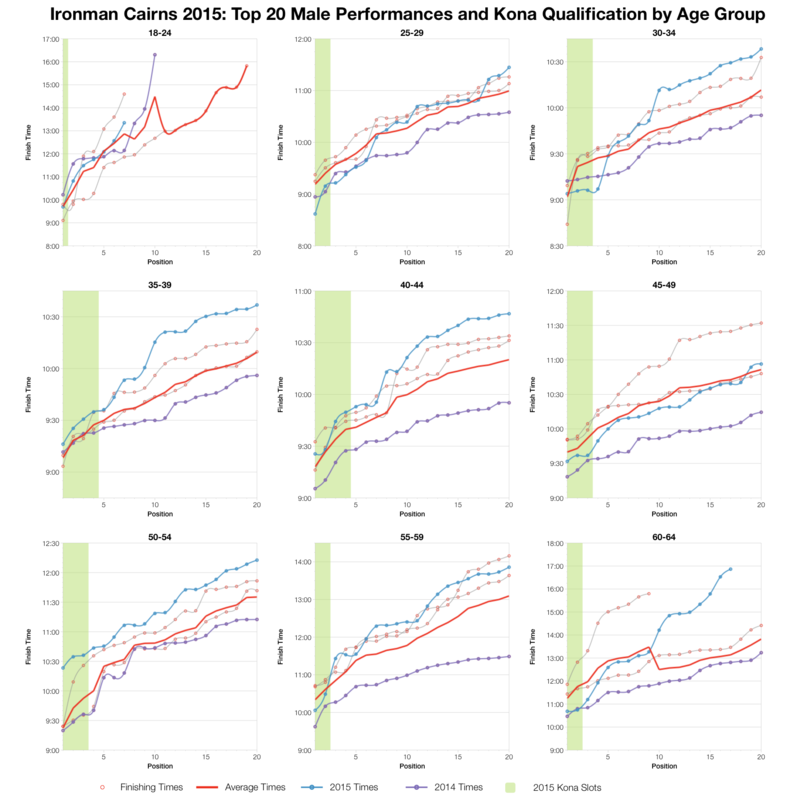 Comparing age group medians doesn’t give a clear insight into the race. 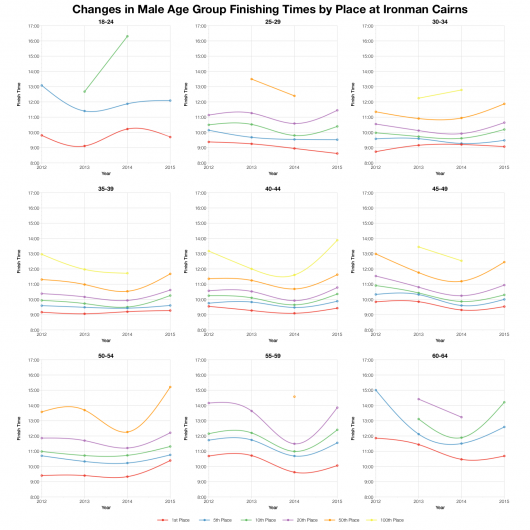 We can safely say this year’s swim was faster, but beyond that there’s a lot of variation across age groups. 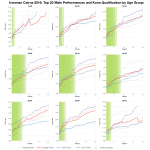 For every bike or run that’s slower, there’s an example of an age group where times were faster. 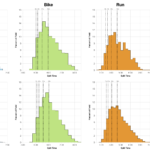 The split distributions help here. 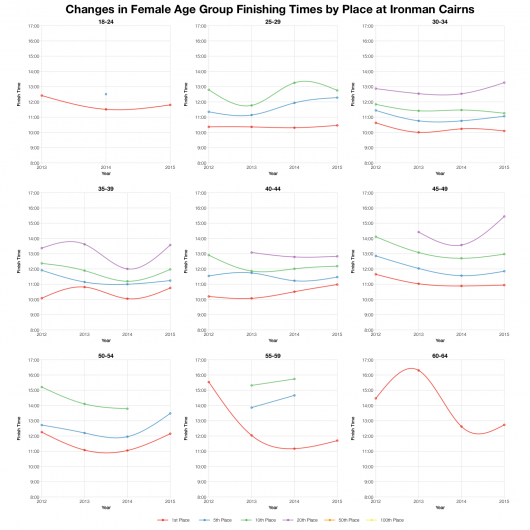 It’s clear that, for whatever reason, the swim was much faster this time round. 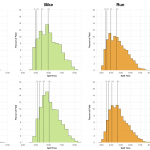 It’s also more apparent that the bike was trending a little slower, in the region of 5-10 minutes. 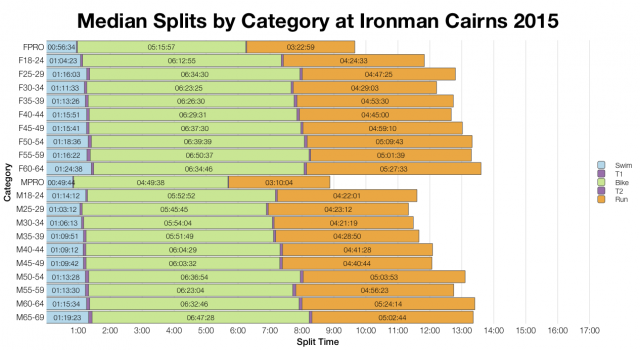 The two largely balance each other out, while the run is similar to previous events. The outcome is finishing splits that appear fairly typical, perhaps a little slow, for Cairns. 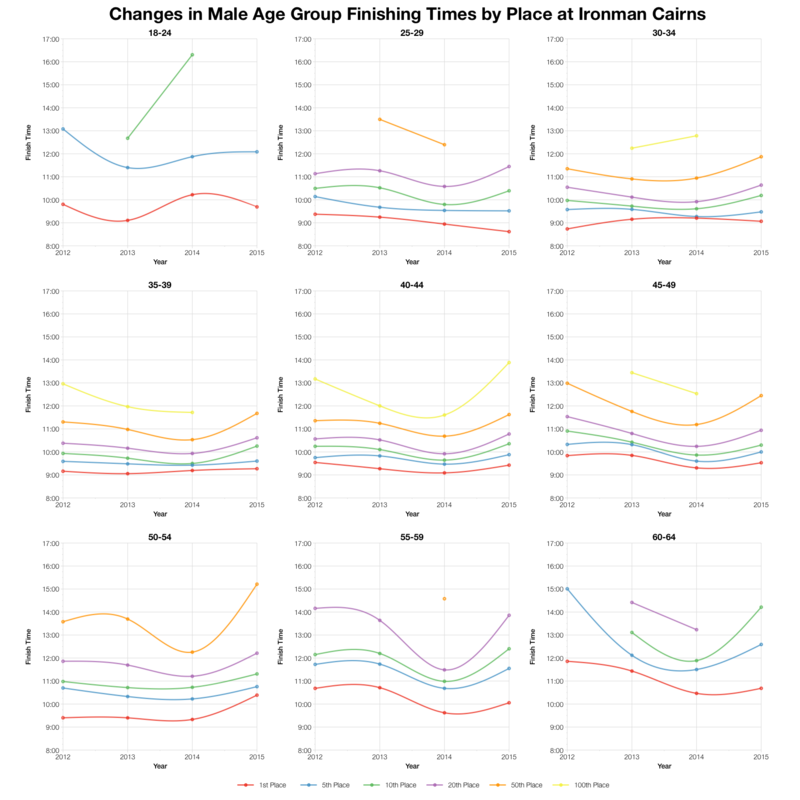 A good way to track relative speed of a race is to look at how times have changed at different points in each age group. 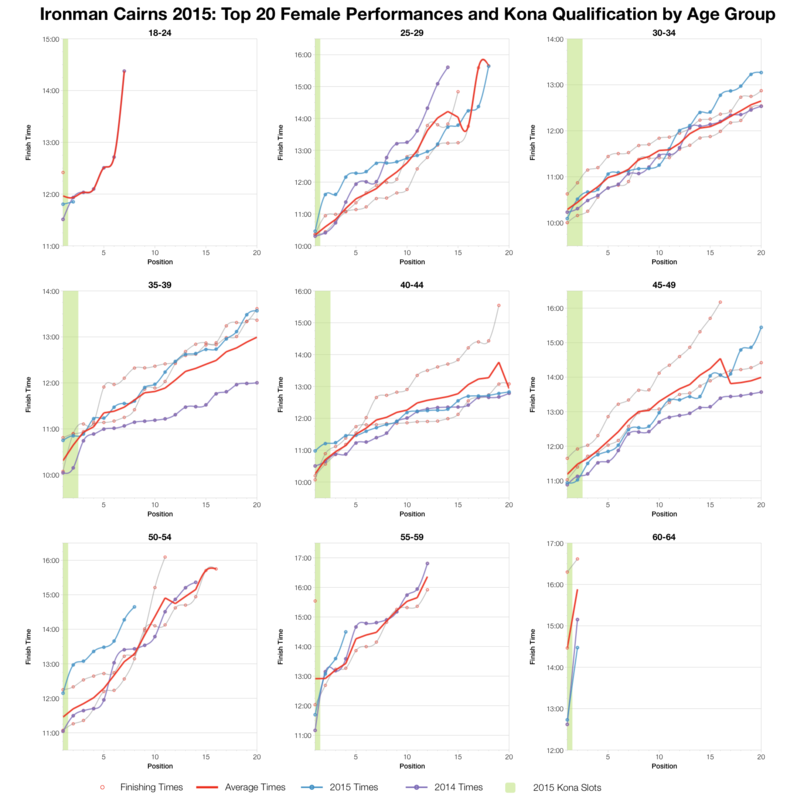 As the above charts show this year’s race was probably a little slower, although not by a huge margin. 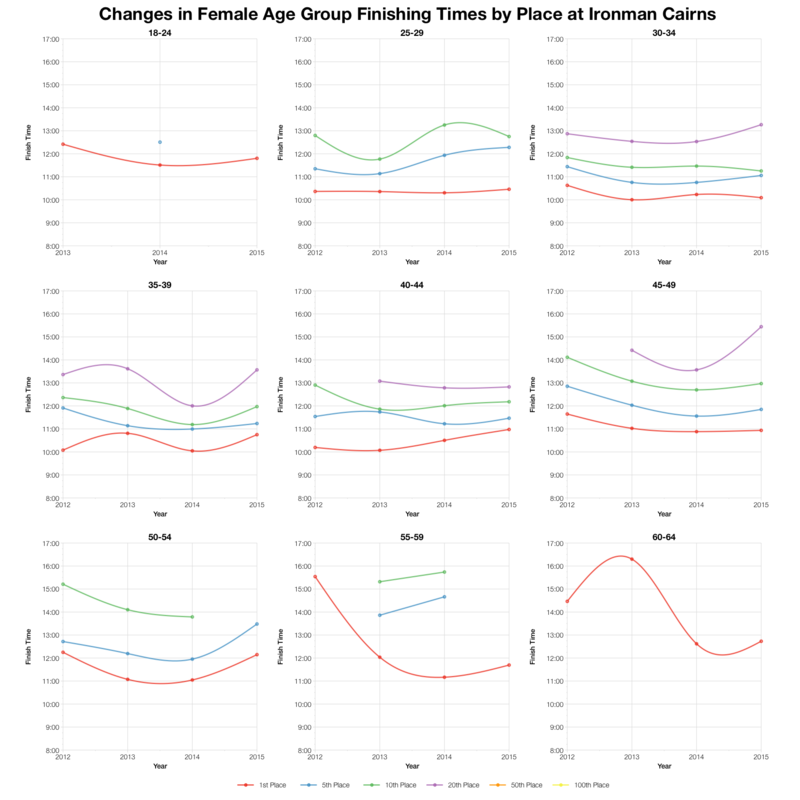 Times at the front of the age group women’s race didn’t deviate much from previous years; most age groups fall somewhere around their averages. 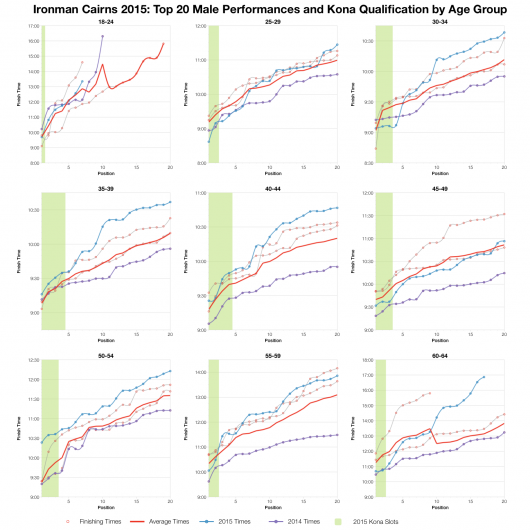 In the men’s race there’s much more variability. 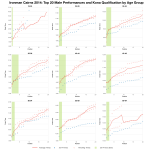 Generally the very front of the age groups, around the top 5, come out about the average, but behind that the fall off is a steeper than normal. So while there was definite competition at the front there was perhaps a little less depth. You can access a spreadsheet of the full results and splits from Ironman Cairns 2015 on my Google Drive.